Innovation is the source of new products for a company. As I’ve discussed previously, innovation doesn’t usually happen as it is shown in movies, with a single person having an ‘aha!’ moment. Instead innovation generally comes from a combination of experiences, ideas and expertise from multiple people and is a process rather than a single moment of discovery. Here are a few lessons learned over the years for product innovation. 1. See what is there, not what I think is there and verify observations. I’ve learned how important it was to truly pay attention to people who are doing a specific task related to a product. It was easy for me to assume an action had a specific meaning by interpreting the action based on my knowledge or boundaries. But by carefully watching, I learned many new ways that people use a specific product. Also, it was key to actually ask people questions about their actions as what the person was doing may not be at all what I thought I saw them doing. During research, we may look at a collection of images or items related to our products or services. A widely disparate group of items can actually have a meaningful pattern. After looking at enough products or pictures, I began to see patterns, which might suggest a new product idea. This method can also be useful for – topics as by working to rearranging them in various groupings, I may see patterns that are both relevant to item’s function and useful to my thought process. By observing people, patterns start to emerge about their actions. Sorting the patterns and diving into them can help develop the insights that become new products. As part of an innovation project to develop a new tea bag, we went to many tea and coffee shops and watched people drink tea. We saw many patterns on how tea was drunk, but watching what the person did with their tea bag afterwards led us to our key insight that dealing with the bag itself was a huge pain point for customers. In the end, we developed a tea bag holder, rather than a new tea bag, to address the true pain point that we had seen. Discussions about lead users and people who develop products that consumers haven’t yet asked for were enlightening. Great companies develop products that consumers didn’t realize they even wanted but, once on the market, can’t live without (such as the snuggie or the ipod). By becoming aware of this insight, managers and product developers will ideally ask the right questions of customers when doing research. The key question is ‘why’. By constantly asking why, product developers and innovators can learn the true pain points of a particular product or service. Understanding the pain point can lead to the development of truly innovative products. Over the years as I have developed many new products, I learned the importance of building prototypes and testing them. We’ve all heard stories of products that were developed and launch without consumer testing only to have them turn out to be catastrophic failures or, even worse, highly dangerous. A simple example was during an exercise to build a vegetable car in an innovation course. As part of the ‘Kenan-Flagler 500’ we built a car from a spaghetti squash, 4 onions, and two bamboo skewers. Our team had tested a few different prototypes and learned what works. In contrast, it was clear from how other teams’ cars were made that they had not made multiple prototypes but on had made one example, and in some cases hadn’t even tested it before the the event. We knew ours would work well as we had already discarded the ones that didn’t work well, and tested the prototype that was successful. I’ve always gleaned key insights from prototypes which we can apply to future versions. Throughout my career, I’ve seen how using a process can help people come up with innovative and new ideas. Going back to the tea bag project, my team developed a great new product, but it would not have happened had we not had both the passion for the subject (we all enjoy tea) and applied the design process that we used. The process forced us to speak with consumers, make prototypes that helped us figure out what works and what doesn’t, and modify them to create the final prototype. The process was what guided us. While some companies have R&D teams that already might do some innovative projects, for many people in the company, developing innovative ideas is harder. 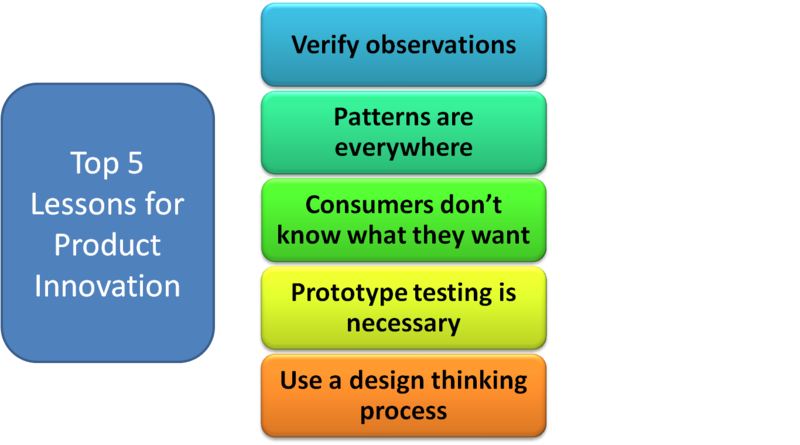 Having a design thinking process, such as the Stage Gate Process or others, can help companies design and develop new innovative products. Having a great innovation process can lead to new products that your customers will want. And isn’t that the whole point? This entry was posted in Entrepreneurship, Innovation, Marketing, Marketing Strategy and tagged innovation, innovation process, LinkedIn, new product development, Product innovation. Bookmark the permalink.